"Heroic Martyr Omar Abu Laila" is "the perfect person"
deserving of a "military salute"
"Glory and eternity to the Martyrs"
"The Shabiba Movement of Fatah in Palestine accompanies to his wedding (i.e., to the 72 Virgins in Paradise) the Heroic Martyr"
"the role models for the children"
Last night, Omar Abu Laila, the terrorist who murdered 2 Israelis earlier this week, was killed by Israeli forces during a gunfire exchange when the forces came to arrest him. In keeping with Palestinian Authority and Fatah tradition, Abbas' Fatah Movement immediately glorified the dead murderer as "the perfect person," in addition to his being a "heroic Martyr" deserving of a "military salute." 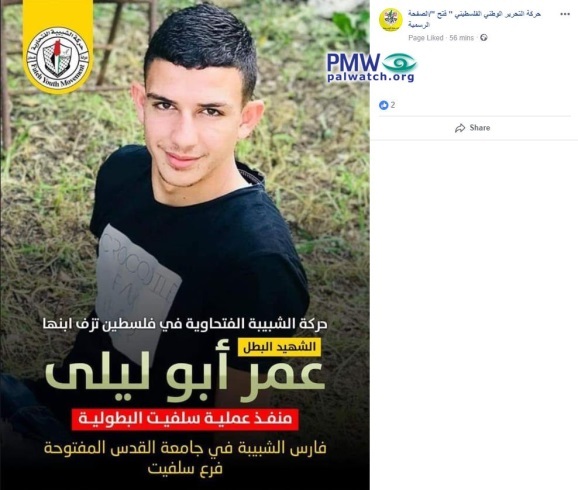 Once again, Fatah used Facebook as the means to disseminate its support for murder of Israelis and to broadcast its message of support for terror to the hundreds of thousands of Palestinian Facebook users. Fatah's official page alone has more than 170,000 followers. PMW is surprised and disappointed that Facebook knowingly allows itself to continue to be an important platform for support of Palestinian terror. In February, PMW sent Facebook our 40 page report documenting the repeated terror support by Fatah on its Facebook page throughout 2018. By allowing itself to be used to honor and glorify terrorist murderers in real time, Facebook serves as a platform for encouraging more terrorists and literally endangering lives, even if Facebook removes the terror supporting posts at a later date. Text on image: "Heroic Martyr Omar Abu Laila"
Posted text: "The Martyr (Shahid) represents the moment of transcending these blind instincts, as he stands firm before death and transcends the conditioned reflexes - then the perfect person is realized within him, to whom we give a military salute." Posted text: "Martyr (Shahid) Omar Abu Laila from the town of Al-Zawiya, the one who carried out the Salfit operation. Glory and eternity to the Martyrs." 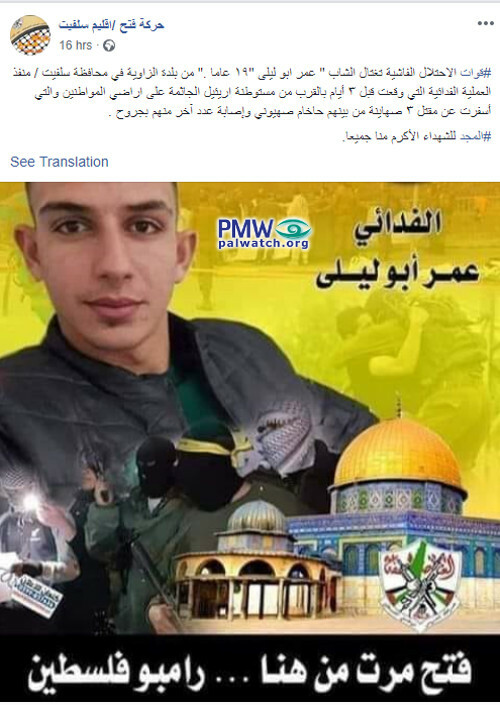 Fatah's official Facebook page also published two items honoring the terrorist by Shabiba, Fatah's youth movement, in which the murderer was praised as "more honorable than all of us." 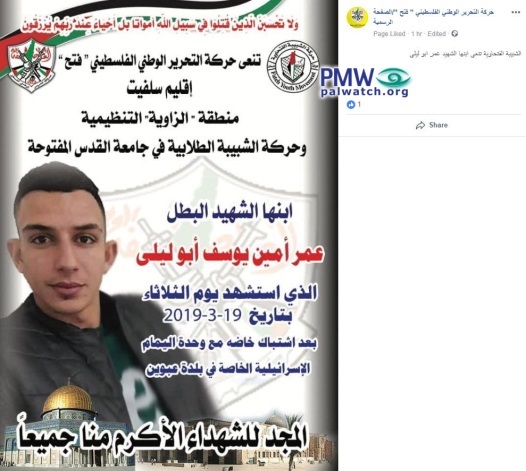 Posted text: "Fatah's Shabiba [Youth Movement] eulogizes Martyr Omar Abu Laila (i.e., terrorist, murdered 2)"
"'And never think of those who have been killed in the cause of Allah as dead. Rather, they are alive with their Lord, receiving provision' [Quran, Sura 3:169, Sahih International translation]. Glory to the Martyrs who are more honorable than all of us"
Knight of Al-Quds Open University Shabiba, Salfit Branch"
Both of these posts include the Fatah Shabiba logo with the PA map of Palestine that includes all of Israel, and has the texts: "The State of Palestine" and "Fatah - the perpetual revolution." Posted text: "Zionist counter-terrorism and reconnaissance units, the Zionist Paratroopers Brigade, military and reconnaissance aircrafts, senior officers in the Israeli Security Agency, Zionist Duvdevan [anti-terrorist] forces, and thousands of the occupation's soldiers - all of these wild dogs pursued a Fatah lion cub, not yet 20 years old, for about three days. He frightened them, shocked them, crushed their terrorist security system, and destroyed their fragile myth [of Israel's strength]. Then his pure soul ascended to Heaven as a Martyr (Shahid) from the missiles and bullets of these murderers, who murdered him in cold blood this evening [March 19, 2019] in the village of Abwein in the Ramallah district. To Heaven, heroic Martyr Omar Abu Laila, together with 'the prophets, the steadfast affirmers of truth, the martyrs and the righteous. And excellent are these as companions.' [Quran, Sura 4:69, Sahih International translation]"
Text at top of image: "Self-sacrificing fighter (Fida'i) Omar Abu Laila"
Posted text: "To you the glory, the blessing, the peace, [Allah's] mercy and the honor, O lion, Fatah member, Martyr (Shahid) and daring fighter Omar Abu Laila. May Allah have mercy on you, the lion of the Salfit district." 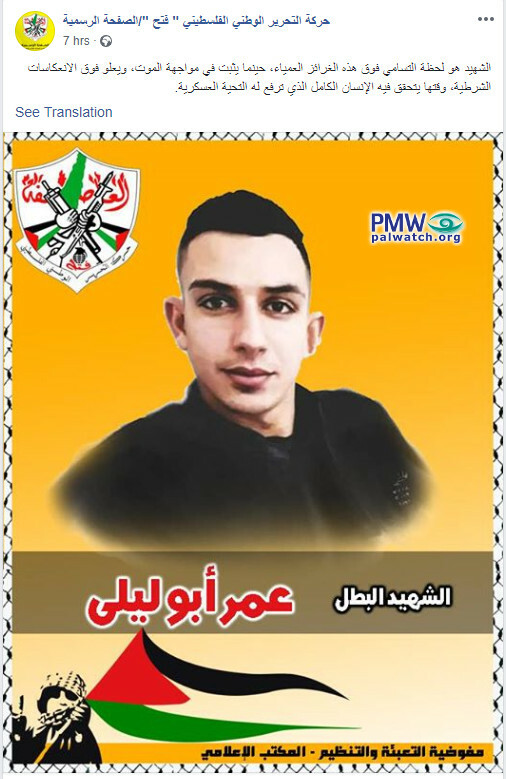 Posted text: "The fascist occupation forces assassinated Omar Abu Laila, 19 from the town of Al-Zawiya in the Salfit district, the one who carried out the self-sacrificing operation that took place three (sic., 2) days ago next to the settlement Ariel, that sits on the [Palestinian] citizens' lands. Three (sic., 2) Zionists were killed in the operation, among them a Zionist rabbi, and some others were wounded. Glory to the Martyrs who are more honorable than all of us." 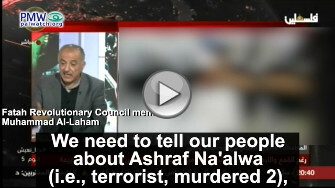 "Role models for the children"
Fatah Revolutionary Council member Muhammad Al-Laham: "We need to tell our people about Ashraf Na'alwa (i.e., terrorist, murdered 2), to tell it about the guy from Salfit yesterday (i.e., terrorist Omar Abu Laila, murdered 2) - how he humiliated the occupation and its intelligence [service]. 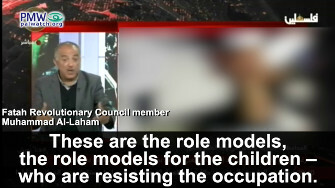 These are the role models, the role models for the children - who are resisting the occupation." 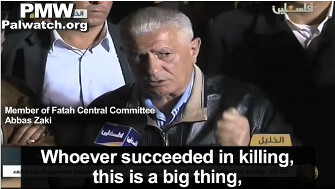 Palestinian Media Watch has documented hundreds of examples of similar statements by PA and Fatah leaders expressing their awe and respect for terrorists who have "succeeded' to murder Israelis. Some have specifically asked that murderers should be eternalized by having buildings and institutions named after them. 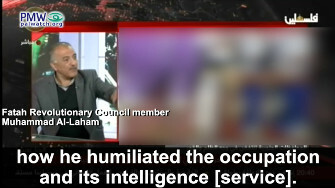 Member of Fatah Central Committee, Abbas Zaki: "They [the Martyrs] are giants and leaders who have written the future of the region. These Martyrs of Al-Aqsa [Mosque] have outshined the political leadership and scared Israel... Raed (i.e., terrorist who stabbed one) is not [just] a Martyr from [t he town of] Sa'ir, or the Hebron district. Raed is just like Iyad Al-Awawdeh (i.e., t errorist who stabbed one), Alaa Abu Jamal (i.e., terrorist who murdered two), and Muhannad Halabi (i.e., terrorist who murdered two). These are pioneers. Raed is one of the greatest pioneers... 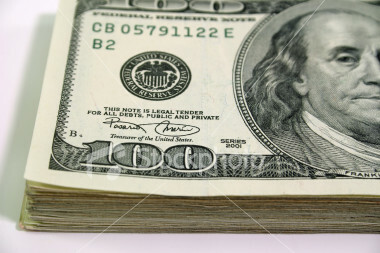 I believe that, Allah willing, something will be built and named after him [Raed]. When Palestine is liberated, Allah willing, he will have at least an institution named after him, and a statue [made] of him... Everyone who loves Palestine and wants Israel to be scared, should salute [all] the deceased - whether they were Martyrdom-seekers, or Martyrs. Whoever succeeded in killing, this is a big thing, and whoever succeeded in at least scaring the Israeli pedestrian is also a Martyr." 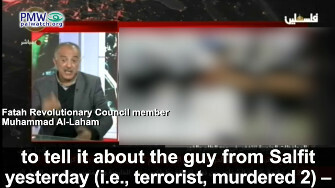 During the same terror wave, senior PA leader Jibril Rajoub expressed his and Fatah's veneration for all the terrorists who had carried out attacks against Israelis - singling out murderer of 2 Muhannad Halabi - calling them "heroes and a crown on the head of every Palestinian." Statements by the Palestinian Authority and Fatah leaders in which they distancing themselves from terror are made only in Washington and other Western capitals and of course to Western media. To Palestinians, both PA and Fatah leaders present terrorist murderers as heroes and role models. Omar Abu Laila - Palestinian terrorist who stabbed Israeli soldier Gal Keidan, stole his weapon, and shot and murdered him at Ariel Junction on March 17, 2019. Abu Laila then shot at passersby, murdering Rabbi Achiad Ettinger, and stole the car of a civilian who had fled the scene, which he drove to Gitai Avishar Junction, west of Ariel, where he shot and seriously wounded another Israeli. Abu Laila was shot and killed on March 19, 2019, during a gunfire exchange with Israeli soldiers when they attempted to apprehend him. Ashraf Walid Suleiman Na'alwa - 23-year-old Palestinian terrorist who shot and murdered 2 of his Israeli coworkers, Kim Levengrond-Yehezkel and Ziv Hajbi, in a factory in the Barkan Industrial Zone near Ariel on Oct. 7, 2018. Na'alwa fled the scene, but was located on Dec. 13, 2018 in Nablus and shot and killed in a shootout when the Israeli army and police tried to apprehend him. Israel ordered the partial demolition of the Na'alwa home as a result of Ashraf Na'alwa murdering 2; the house was partially demolished on Dec. 17, 2018.The Izz A-Din Al-Qassam Brigades (Hamas' military wing) claimed responsibility for the attack. Until this attack, the Barkan Industrial Zone had been an example of coexistence with Israelis and Palestinians working together.